I was forced to take my car to Firestone yesterday since the shop that installed my new shocks and rear springs told me my rear pads were worn down and not engaging. My car will roll down the driveway if I don't hold down the brake. 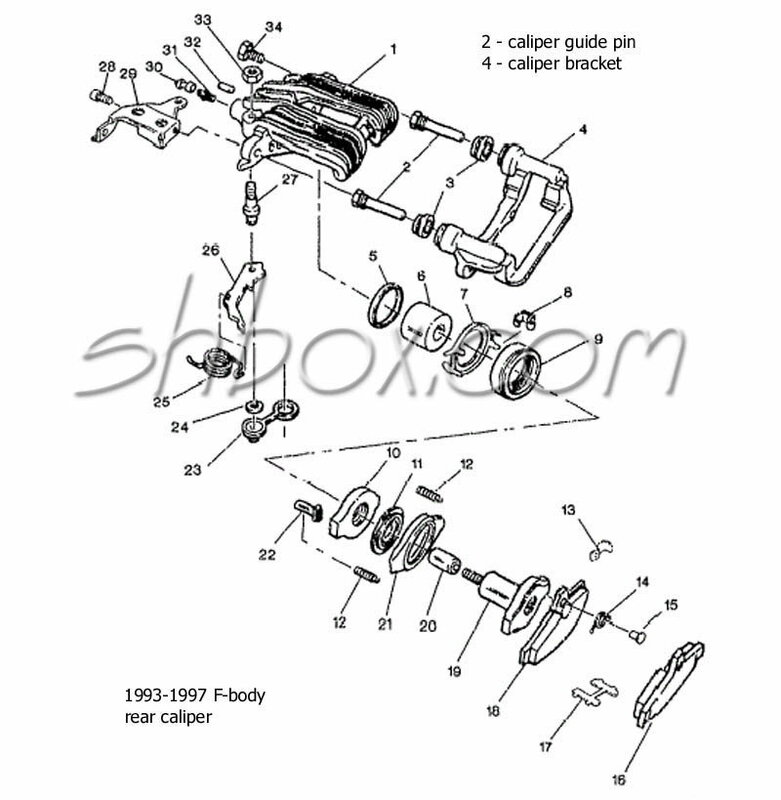 Well, the rear pads are fine but Firestone claims to have identified the problem as being my calipers and this spring in the diagram below. GM part #25. So, they have tasked me with trying to find two replacement springs for my rear parking brake assemblies, GM #25. Honestly, the parking brake seems to hold okay after they greased the damn thing tugging on the calipers and my calipers are not that old. Does anyone think the springs are just worn out and need replacing and if so who has them?! I found some USED rear calipers on ebay for 1989-1992 Camaros that seem to use that exact same spring but do I want to take the chance on using them? I can only do certain work on my car but this seems to be beyond me and I question that I also need new calipers if the problem is clearly the parking brake assembly not engaging all the way. What suggestions can you give me? I plan to have the other shop look over my car and give me their honest opinion on it. Or, since my car is an "antique" and one shops don't want to work on, is having my emergency brake system upgraded to the 1998 - 2002 F-body system of any merit? Re: I need help diagnosing semi-functioning parking brakes. I would recommend you look over the diagnosis sheets in the factory service manual. In the 1996 manual (same as 97) in Volume 1 of 2-part 1 of 2, page 5-4 there is a chart showing the brake problem symptoms on one axis and the causes on the other. One of the listed symptoms is "Parking Brake Won't Hold" and there are multiple causes including the pads, rotor finish, the caliper and pistons, and the cable. That chart then tells you which diagnostic section to use. Thank you! I am looking it over now. Okay, I found this website to help me. What I am looking for is the Parking Brake Lever Return Spring. If I can find replacements, then this fix I can do myself easily. This is assuming the springs are the problem. Seems to me that the spring RETRACTS the lever when you drop the handle to let off the e-brake. Not sure how that would prevent the e-brake from clamping the inner pad. But I could be wrong. The exploded diagram above isn't real clear as to how the spring gets assembled. But in the left-hand photo on LT1tech, it looks clearer. When you pull up the e-brake lever, what happens to the lever? Does it force the inner pad against the rotor and stop the rotor from moving? Last edited by Injuneer; 04-14-2019 at 03:21 PM. Yeah, I was thinking the same thing about how that spring would be causing my problems. One thing did dawn on me after driving my car the other day, the spring is not retracting all the way! I actually felt some bite on my rear passenger side while driving. When I pulled over the disk was pretty damn hot with the flick of my finger! So the other shop was right, my inner pad which I could not see at Firestone may actually be wearing down. Firestone only showed me the outer pad because they won't cover this work under the warranty I have. I need to check with the other shop and get their opinion but I am now at the point that Firestone is a con job. My car being an "antique" is no excuse to not do the actual look-up and figure out what is wrong with the thing. Supposedly there was a Chevrolet dealer that claimed to have these springs in stock but they are asking $100 per spring. I may be better off taking the springs off and seeing if any local spring manufacturers can custom make me these same springs to the same spec they were before. If the cost is more than $100 per spring then I will buy the dealer springs, IF they even have the right ones! I am not asking for drum springs, lol. Last edited by Phoenix'97; 04-14-2019 at 09:45 PM. Maybe the cable is sticking. Maybe the caliper slide bolts pins are sticking. Maybe the piston isn’t retracting. Maybe there's heavy corrosion on the moving parts, like the pivot pin for the lever.. I wouldn’t jump to the conclusion it’s those springs without a detailed look at each of the above. Might be able to fix it with WD40. What matters right now is that the parking brake seems to be working now after whatever Firestone did. The car has been holding itself up the driveway each time I have come back home to test it. Of course I keep the car in gear but the parking brake is working for now. Perhaps it was salt contamination somewhere? I will leave it alone for now but this thread was started because of the suggestions of the automotive technician who is the only one they allow to work on my car at Firestone. How am I to know any better? I thought I was offering suggestions, with technical clarifications.... apparently I wasn't meeting your requirements. Your help was greatly appreciated. Again, there is certain kind of work I can do or am willing to do on my car until I feel I need a more qualified person to handle it and my braking system is one of those kind of work. After Firestone suggesting I needed new rear calipers which are barely several years old on top of the replacement springs, the parking brake is actually working for now so I will leave it alone until it starts to fail again. You asked for help diagnosing the problem, but when I offered suggestions, you indicated you have to go with your “expert”. Why ask for help if you only believe the expert? Maybe the cable is sticking. Maybe the caliper slide bolts pins are sticking. Maybe the piston isn’t retracting. Maybe there's heavy corrosion on the moving parts, like the pivot pin for the lever..
Might be able to fix it with WD40. I did find page 5-4 of Volume 1 of the Service Manual. Since the parking brake is now working, either the greasing that Firestone performed did the trick despite being warned against it in the service manual, or there was salt contamination and now with some good rain storms here in NY it cleaned off the calipers and rotors. It is pointless to try to fix it if it ain't acting broke. Last edited by Phoenix'97; 04-17-2019 at 10:43 AM. Sorry I wasted your time with my “broad” suggestions. Maybe next time someone more capable in your eyes will help you out. Stuff like this that makes me wonder why I even try to keep this site alive. Maybe it"s time to just move on. While you are busy guilt tripping you fail to see that you actually did help me. I now have a digital copy of the service manual for my car. THANK YOU! After having created this thread my parking brakes seem to be working, though there are tell-tale signs that they are sticking and then popping open once I let on the clutch. So it is under assumption from the service manual that all the salt contamination during the winter played a role in the parking brakes not engaging the way they should. THANK YOU! What more do you want from a guy who is not a full-fledged and ASE certified automotive technician/mechanic? Certain things I am leery of screwing with on my car because I don't know what I am doing! A service manual and DIY book only give me so much knowledge but not all of the tricks of the trade! My headlights stopped functioning the other day..
Quick Reply: I need help diagnosing semi-functioning parking brakes.